1. Ball Knob, 4 miles Northeast of Alvord, on the gravel road off the old Alvord Highway. 2. Pella, on the North county line, 10 miles Southwest of Forestburg. 14. Anneville, 7 miles South of Decatur off Hwy 730. 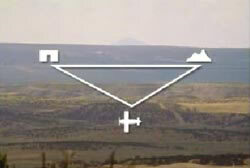 Note: School house marks location. 16. Cottondale, 8 miles South of Paradise. 1. A fortune in gold was buried by Dutch furniture and wagon maker somewhere near the old wagon factory at Bridgeport. 2. A large shipment of gold was stolen from a stagecoach and buried North of the spring at the first stage stop out of Bridgeport. 4. H. C Ruth buried several bags of gold coins in 1871 on his ranch, between two trees on the banks of a creek. He was killed by an outlaw while going into town, the cache has never been recovered. 5. The Shannon Ranch near Paradise was used as a hideout by gangsters in the 1930’s, it is believed stolen loot is hidden on the property. 7. Sam Bass was in a gun fight with lawmen at Salt Creek near Cottondale and buried some of his loot there. It has yet to be recovered. 3. Veal’s Station, 9 miles North of Weatherford on Hwy 51, then 1 mile off the road to the site. 4. Rock Creek, on the railroad and West County line, 4 miles East of Mineral Wells. 1. Mexican outlaws robbed the early settlers in the Weatherford area in the 1840’s. Towns folk revolted and chased and killed most of the gang but the leader buried a large cache of gold coins and other loot in the area of Weatherford near the old outskirts of town. 2. In 1930 an old CCC camp was located outside of Weatherford near the old Curtis Diggings. 6. Kennedale, on the railroad, 5 miles NW of Mansfield. 1. William Riddle, a wealthy farmer reportedly buried $100,000 somewhere on his ranch which was near Fort Worth. The Lost House Range Placers…. more than $500 million dollars. In the state of Victoria…..
decrease in armed robbery with firearms, this has changed drastically upward in the past 12 months, since the criminals now are guaranteed that their prey is unarmed.There has also been a dramatic increase in break-ins andassaults of the elderly, while the resident is at home. safety has decreased, after such monumental effort and expense was expended in ‘successfully ridding Australian society of guns….’ You won’t see this on the American evening news or hear your governor or members of the State Assembly disseminating this information. hands of honest citizens save lives and property and, yes, gun-control laws affect only the law-abiding citizens. WHY? You will need it. FORWARD TO EVERYONE ON YOUR EMAIL LIST. DON’T BE A MEMBER OF THE SILENT MAJORITY. New metal detecting web site…..
gold coins, colonial coins, NJ Coppers, pics, videos and more. Farmington, New Mexico, 1933. In the heat of the summer, a pilot named Red Moiser landed several mysterious flights in the desert. There, he was met by a Mexican millionaire named Leon Trabuco. It’s believed that Trabuco and four other men were quietly buying up much of Mexico’s gold reserves to resell in the United States when the price went up. Trabuco was convinced that because of the Great Depression, the United States would soon devalue the dollar, and that gold prices would skyrocket. But the chance to make huge profits carried huge risks. The gold had to be smuggled into the United States. If the men were caught, they faced long prison terms. At a makeshift Mexican foundry, gold coins and jewelry were melted down and cast into ingots. In less than three months, the partners had collected almost 16 tons of solid gold. Trabuco searched the US for a safe place to hide the illegal treasure. When he couldn’t find a suitable spot, he decided it would be smarter to bury the gold. Legend has it that Trabuco chose a sparsely populated region of New Mexico, near the Ute and Navajo Indian Reservations. Red Moiser allegedly made 16 flights, carrying one ton of gold each time. Pick up trucks then transported it to a secret burial site. Trabuco never revealed the location to his co-conspirators. And he never made a map. 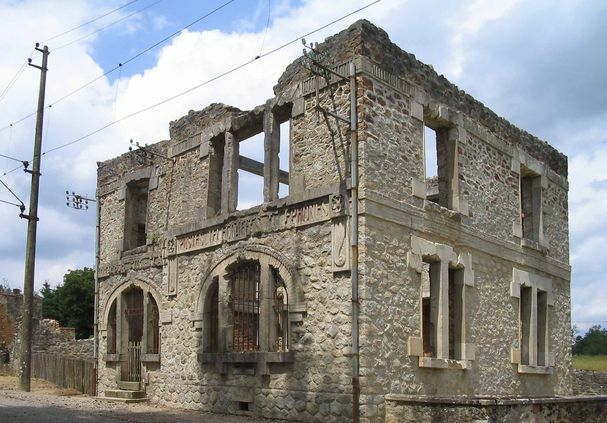 Records indicate that the final shipment was delivered on July 14, 1933. Six months later, the Gold Reserve Act of 1934 became law. The price of gold soared. Overnight, the men’s potential profit increased by seven million dollars. The gold seemed to bring bad luck. Within five years, three of the partners had died untimely deaths. Over the next two decades, Trabuco was unable to sell the now illegal gold. When he died, he apparently took the secret location to his grave. Stone bracelet is oldest ever found in the world….. It is intricately made with polished green stone and is thought to have adorned a very important woman or child on only special occasions. Yet this is no modern-day fashion accessory and is instead believed to be the oldest stone bracelet in the world, dating to as long ago as 40,000 years. Unearthed in the Altai region of Siberia in 2008, after detailed analysis Russian experts now accept its remarkable age as correct. 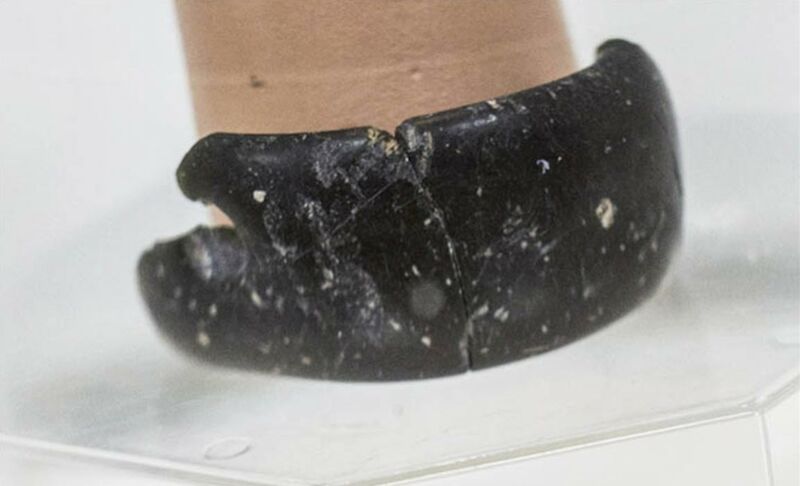 New pictures show this ancient piece of jewellery in its full glory with scientists concluding it was made by our prehistoric human ancestors, the Denisovans, and shows them to have been far more advanced than ever realised. 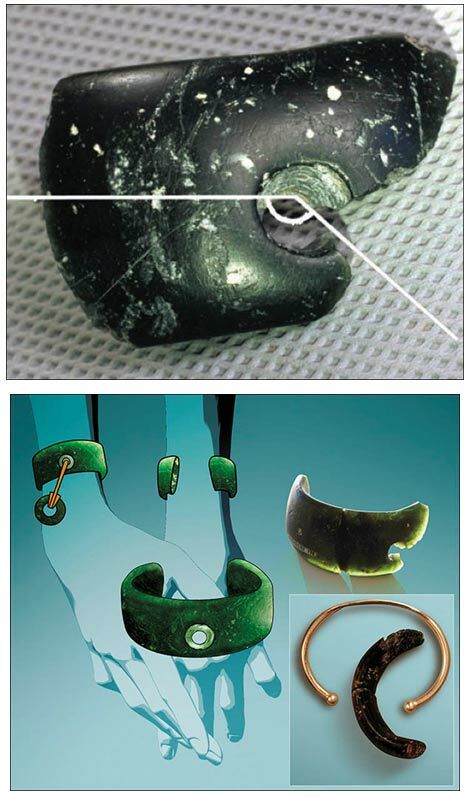 ‘The bracelet is stunning – in bright sunlight it reflects the sun rays, at night by the fire it casts a deep shade of green,’ said Anatoly Derevyanko, Director of the Institute of Archaeology and Ethnography in Novosibirsk, part of the Siberian Branch of the Russian Academy of Sciences. 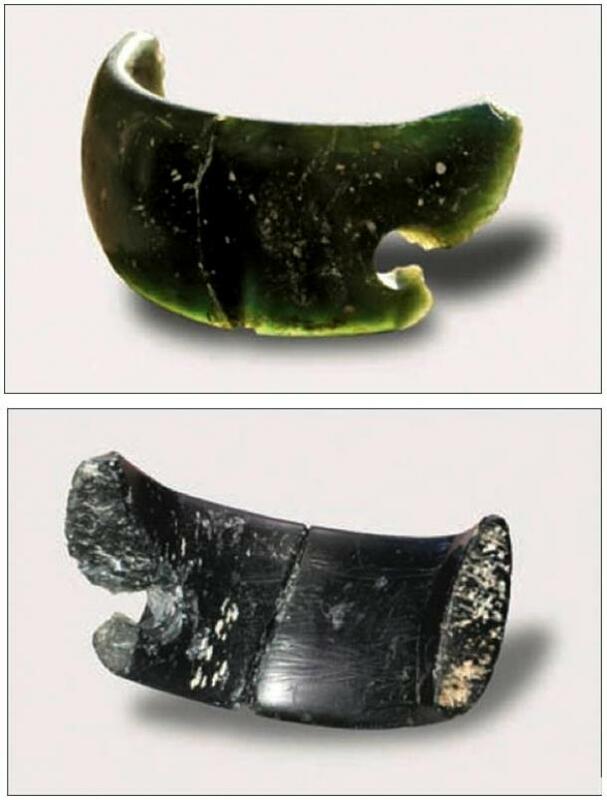 The bracelet was found inside the famous Denisova Cave, in the Altai Mountains, which is renowned for its palaeontological finds dating back to the Denisovans, who were known as homo altaiensis, an extinct species of humans genetically distinct from Neanderthals and modern humans. Made of chlorite, the bracelet was found in the same layer as the remains of some of the prehistoric people and is thought to belong to them. 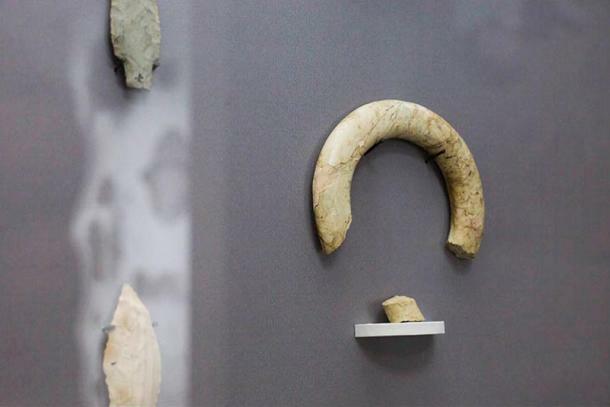 What made the discovery especially striking was that the manufacturing technology is more common to a much later period, such as the Neolithic era. 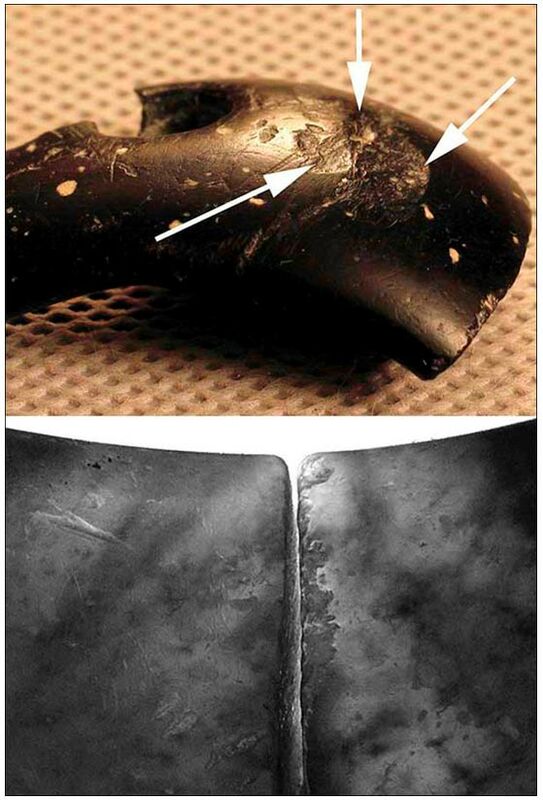 Indeed, it is not clear yet how the Denisovans could have made the bracelet with such skill. 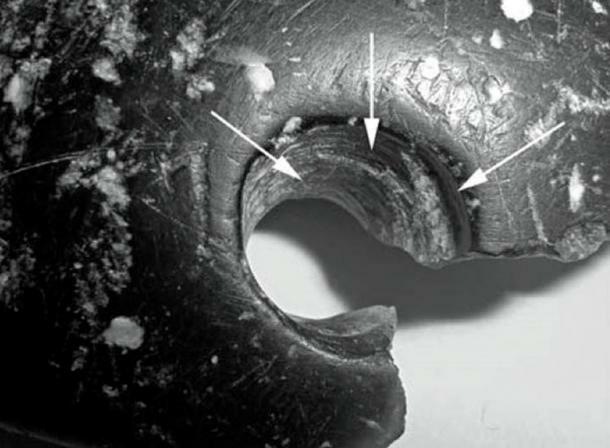 Writing in the Novosibirsk magazine, Science First Hand, Dr Derevyanko said: ‘There were found two fragments of the bracelet of a width of 2.7cm and a thickness of 0.9 cm. The estimated diameter of the find was 7cm. Near one of the cracks was a drilled hole with a diameter of about 0.8 cm. Studying them, scientists found out that the speed of rotation of the drill was rather high, fluctuations minimal, and that was there was applied easel drilling – technology that is common for more recent times. 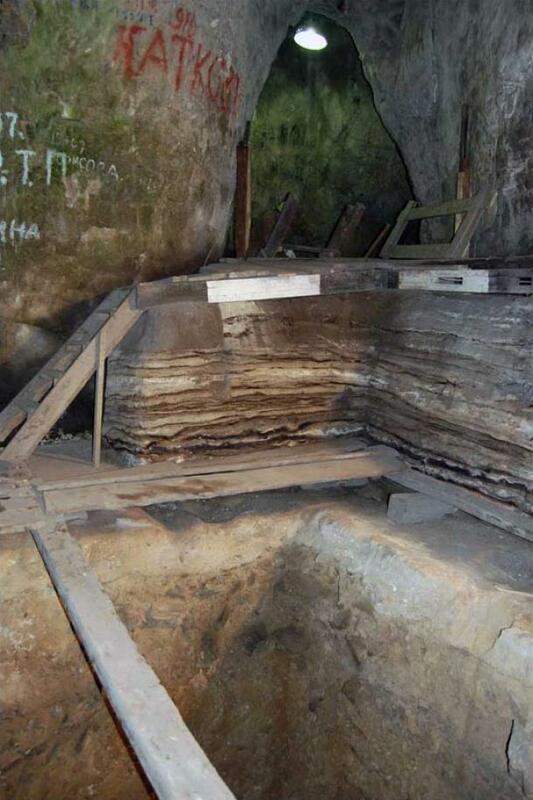 Chlorite was not found in the vicinity of the cave and is thought to have come from a distance of at least 200km, showing how valued the material was at the time. Dr Derevyanko said the bracelet had suffered damage, including visible scratches and bumps although it looked as if some of the scratches had been sanded down. Experts also believe that the piece of jewellery had other adornments to make it more beautiful. 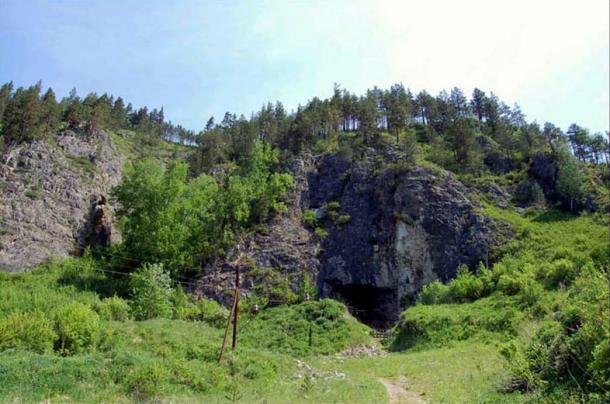 Located next to the Anuy River, about 150 km south of Barnaul, the Denisova Cave is a popular tourist attraction, such is its paleontological importance. 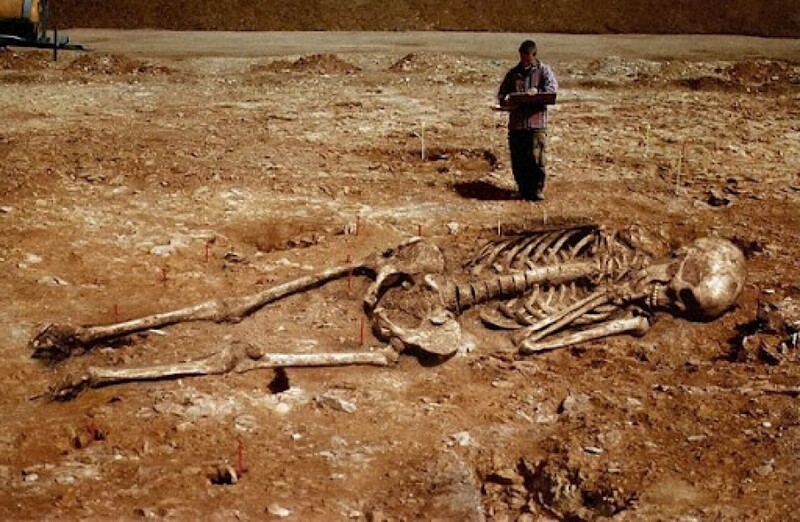 Over the years a number of remains have been found there, including some of extinct animals such as the woolly mammoth. In total evidence of 66 different types of mammals have been discovered inside, and 50 bird species. The most exciting discovery was the remains of the Denisovans, a species of early humans that dated back as early as 600,000 years ago and were different to both Neanderthals and modern man. In 2000 a tooth from a young adult was found in the cave and in 2008, when the bracelet was found, archaeologists discovered the finger bone of a juvenile Denisovan hominin, whom they dubbed the ‘X woman’. Further examination of the site found other artifacts dating as far back as 125,000 years. The institute’s deputy director Mikhail Shunkov suggested that the find indicates the Denisovans – though now extinct – were more advanced than Homo sapiens and Neanderthals. The full details of the ring are yet to be revealed. But could this modern-looking bracelet have been buried with older remains? The experts considered this possibility but rejected it, saying they believe the layers were uncontaminated by human interference from a later period. 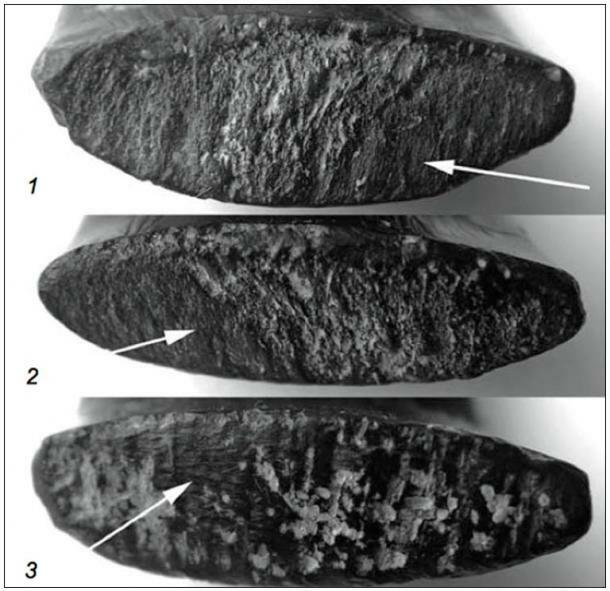 The soil around the bracelet was also dated using oxygen isotopic analysis. The unique bracelet is now held in the Museum of History and Culture of the Peoples of Siberia and the Far East in Novosibirsk. Irina Salnikova, head the museum, said of the bracelet: ‘I love this find. The skills of its creator were perfect. Initially we thought that it was made by Neanderthals or modern humans, but it turned out that the master was Denisovan, at least in our opinion. While bracelets have been found pre-dating this discovery, Russian experts say this is the oldest known jewellery of its kind made of stone. The article ‘Stone bracelet is oldest ever found in the world’ was originally published on The Siberian Times and has been republished with permission. 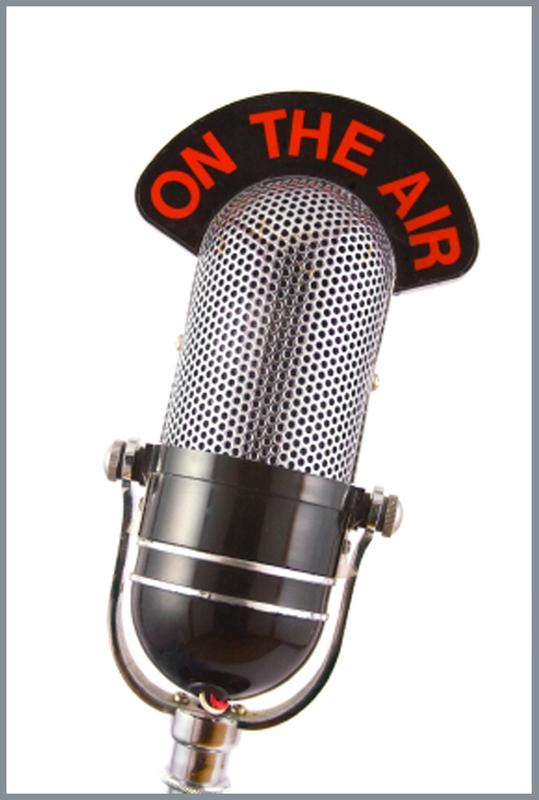 Join us tonight, Tuesday April 14th, 2015.. 8:30PM Eastern time..
Has the hobby/lifestyle of metal detecting been infected?? Too much BS, lack of loyalty amongst us, thievery, lack of respect for property owners with bad digging techniques, over-commercialization of what we do?? Join us as we are immersed in discussion, and debate what the good, the bad, and the ugly of metal detecting/treasure hunting may be!! Mr. Kenny Briggs, Mr. Robert Bohrn, veterans of the hobby/lifestyle, weigh in with their opinions. We’ll also get perspective from some not so long in the hobby/lifestyle!! This is gonna be one interesting, enlightening, and entertaining show you won’t want to miss!! Click the link below to listen through the player, tonight!! Hope to have you all tune in tonight! !